Shrink rings are used to cover the constrictor cord and present a finished professional look to hand-tied speargun and polespear bands. We offer an assortment of sizes for our wide range of tubing diameters. 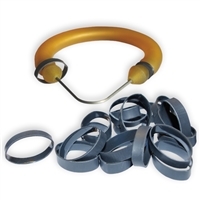 Spearit shrink rings are made from low temperature PVC and are manufactured for us by Insultab in the U.S.A. . The lower activation temperature means less heat is required and when it comes to rubber less heat is better.